We are an ISO 9001:2008 Certified Manufacturer, Exporter and Supplier of Micro Neurosurgical Instruments, General Surgical Instruments etc. The offered range is known for easy installation, dimensional accuracy and durability. 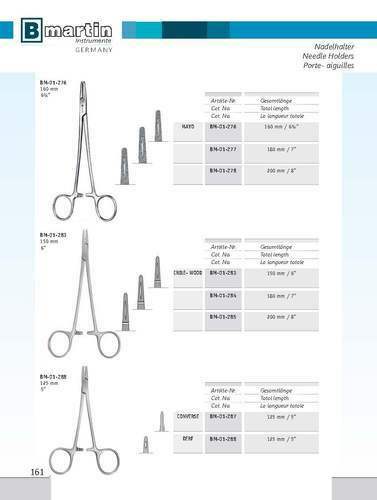 Since our establishment, we have been engaged in manufacturing, exporting and supplying a broad range of Micro Neurosurgical Instruments, General Surgical Instruments, ENT Instruments, Cardiovascular Surgical Instruments, Micro Cardiac Surgical Instruments, Gynecological Surgical Forceps, General Surgical Scissors, Micro Scissors, Needle Holders, etc. The offered range is designed and manufactured using quality tested raw material under the guidance of skilled professionals. Known for high strength, rugged construction, easy handling, corrosion resistance, safe usage and durability, these medical products are highly demanded across the globe.